Magnific Escapades, the specialist for distinctive custom-made getaways and company events in Alsace, invites your team to live a true human, gastronomic, wine, and cultural experience. Let yourself be surprised! Make the best of your valuable time by letting us organize your seminar or your company event in Alsace! Custom made company events and seminars: let’s build your project together! be accompanied by a passionate specialist. 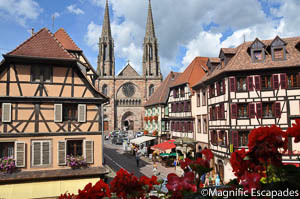 A picnic with a Michelin-star chef, a mountain bike rally on the Wine Route with various tasting workshops, cultural visits, visits of wineries in medieval towns and wine-tasting, mystery role play games, organic pretzel workshops, private concerts…These are some of the numerous activities that we will arrange and personalize for you during your seminar in Alsace! We have extensive international company management experience. A tasting of the best Rieslings from 1996 with commentary by a Best Sommelier of France. Exceptional visits of sites within the Cathedral of Strasbourg that are normally off-limits to the public. 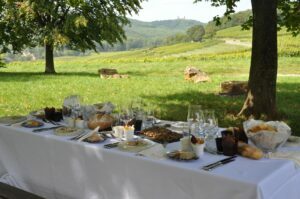 A mountain bike rally on the Wine Route around the medieval city of Obernai with tastings of wine, cheese and chocolate. A presentation of gingerbread secrets associated with wine tasting led by a local winemaker. Listening to your specific needs and expectations, we will allocate all our efforts for the success of your company events and seminars. The following references demonstrate our customers’ satisfaction. Do not hesitate to contact us, we will build your company event together! Together with our management, I would like to express our sincere thanks for your kind collaboration, your kindness highlighted by the participants, and your contibution to the success of this unanimously appreciated seminar. The quality of the services, the welcome, the advice, the follow-up and the organization of our seminar in Alsace were all excellent; our team coming from 15 countries had a very good time (teambuilding sessions) thanks to the helpful advice of Magnific Escapades. I strongly recommend the corporate seminars organized by Magnific Escapades. A day full of discoveries for a journey around the wine !